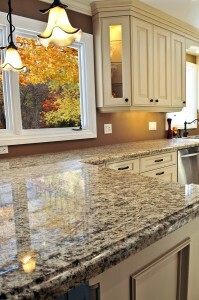 There are many factors that go into choosing the right kitchen countertops for your remodel. So much so that it can be a daunting project to take on. That’s why we put together a helpful guide on choosing the right countertops. Quartz: This is a highly durable engineered stone with little maintenance involved but is costlier than others. Granite: A porous and natural material that needs to be resealed on a regular basis to prevent stains and is also on the higher end of the price range. Concrete: An environmentally friendly option made from a decorative aggregate and a cement binder. Soapstone: A scorch- and burn-free natural material that requires a regular mineral treatment. Limestone: A porous material made of seashells and coral with tints of green, brown, gray, black and white throughout. Marble: A natural and porous stone that is available in limited colors but is incredibly elegant, and also requires regular maintenance. Kitchen countertops are a large selling factor in homes since the kitchen is often the central hub of activity for families. If you’re going to remodel your home and want to select the best option for you, hire a professional contractor to help you through the process. That way, you have expert advice on hand and a specialist to remodel your kitchen in a professional manner.